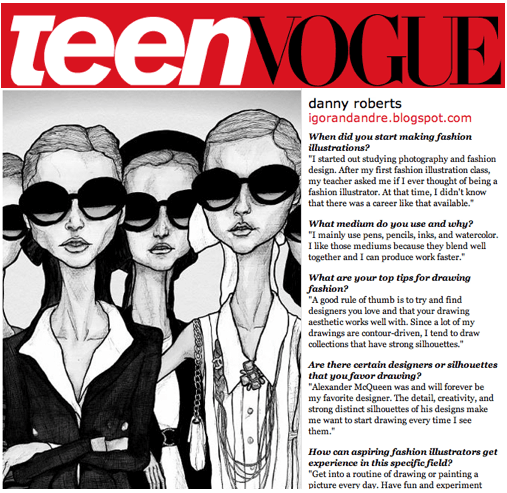 Teen Vogue recently published an article on building a career as a fashion illustrator, and featured former School of Fashion student Danny Roberts. When Danny first came to the Academy of Art University he had planned to study fashion design, but after taking his first illustration class he realized he’d found his calling. Danny offers words of wisdom to aspiring fashion illustrators, advising them to “Get into a routine of drawing or painting a picture every day. Have fun and experiment with your daily drawings. Then, start sharing your drawings with people.” Danny did just that, building a large following through his blog, Igor + André, which he continues to update regularly. He’s also been tapped for several amazing collaborations, most recently with Tiffany & Co, for which he is painting a mural on the store’s facade as it undergoes construction. Read the rest of the interview on TeenVogue.com and be sure to check out more of Danny’s work on Igor + André!